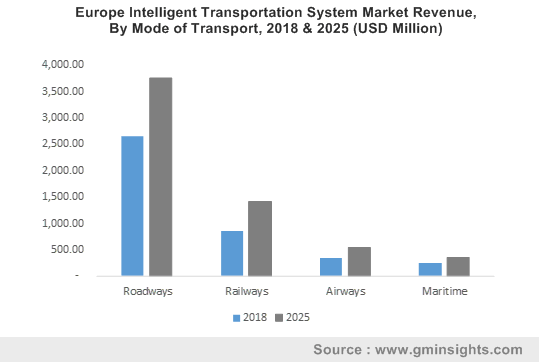 Intelligent Transportation System Market size estimated at USD 23 billion in 2018, growing at a CAGR of over 5% from 2019 to 2025. The intelligent transportation system market is expected to exhibit an accelerated growth over the forecast timeline due to an increase in the adoption of smart transport systems to reduce traffic congestion problems and favorable government initiatives that will foster the development of smart transport infrastructure. ITS combines various types of advanced communication & information technologies to form a network of systems that assist in managing traffic and change the way users, businesses, and governments deal with transportation. It is aimed at providing advanced services to various transportation modes and traffic management solutions such as smart parking assistance, fleet management, intelligent traffic management, smart ticketing solutions, passenger information solution, security & surveillance, and mobility services. Various government initiatives for smart city development have also triggered the adoption of solutions to enhance transport connectivity. Another factor driving the intelligent transportation system market growth is the rapid adoption of IoT to transform the transportation industry by automating roadway, airway, waterway, & railway transportation systems and providing better user experience. The adoption of IoT solutions for smart cities and transportation offers real-time visibility and accurate data, allowing organizations to improve their efficiency while developing smarter cities. Furthermore, an increase in the use of real-time data by traffic authorities to solve traffic congestion issues and reduce the chances of accidents will also drive the demand for ITS. According to the NHSTA’s Report, there were around 52,190 vehicles in the U.S. that were involved in fatal crashes in 2016, out of which 40,908 were passenger cars. Various technologies used in ITS, such as GPS, to provide real-time information about traffic jams in different areas to assists drivers in making alternative routes are preventing traffic jams and reducing the risk of collision. Roadways held a major part of the intelligent transportation system market share of over accounting for over 65% in 2018 and is expected to dominate the market share in 2025. The market growth is driven by various government initiatives for the development of smart cities, which will further contribute to the adoption of smart mobility solutions that will improve the existing infrastructure. For instance, in October 2016, the U.S. Department of Transportation also invested USD 165 million in smart city solutions out of which USD 100 million was allocated for the development of advanced transport solutions. Also, an increase in the number of passenger & commercial vehicles has contributed to traffic congestion. This has further driven the need to adopt smart transport systems, that assist in diverting the traffic away from dangerous areas, reducing traffic jams, and minimizing the risk of collisions. The railways intelligent transportation system market is expected to witness accelerated growth over the forecast timeline due to various governments taking efforts for developing smart railway systems. For instance, in 2017, the Indian government commenced the manufacture of smart locomotives. It installed video & voice recording devices to monitor the engine operation to reduce accidents. The growing dependence on real-time information systems for real-time traffic planning, route scheduling, and intelligent signaling solutions will also foster the ITS market growth. 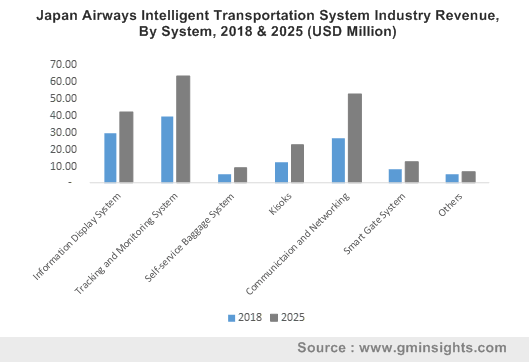 The airways intelligent transportation system market is projected to grow at a CAGR of over 5.5% from 2019 to 2025. The growing trend of intelligent airways systems is attributed to factors such as technological advancements, globalization, and the rising affluence in developing and developed economies. The adoption of IoT and internet services assists in handling air traffic between destinations and at airports, improves customer experience, and provides real-time information, such as arrival time, gate number, check-in line, and flight booking. The marine intelligent transportation system (ITS) market is projected to hold a market share of over 5% by 2025. The ongoing development of transportation systems is bringing about advancements in maritime infrastructure and transportation systems resulting in a growing demand for on-vessel information systems and traffic management to improve the effectiveness and safety of maritime transportation. 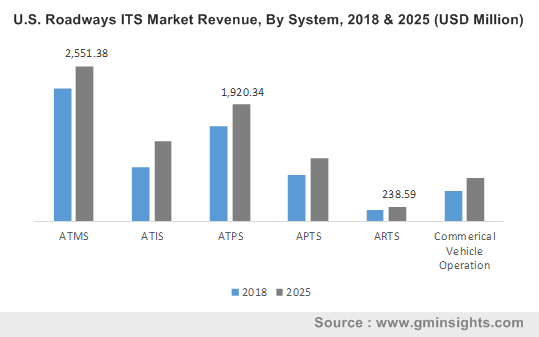 In the roadways ITS market, the ATIS segment is expected to show the highest growth rate of over 6% from 2019 to 2025. These systems provide real-time information to passengers regarding route guidance, traffic regulation, safety and solutions advisory and warning messages. As these systems rely on real-time information to provide up-to-date and accurate information to commuters, the demand for these systems will increase. The hardware intelligent transportation system market is expected to hold a majority of the market share in 2025. The hardware segment mainly comprises various sensors, detectors, cameras, and telecom networks to gather information related to the vehicle and its surroundings. The use of IoT sensors and advanced communication technologies enable the real-time collection and processing of data to assist traffic authorities in taking informed decisions about managing the traffic. The implementation of these devices to support the smart transport infrastructure is expected to accelerate the demand for hardware components. The rail traffic management intelligent transportation system (ITS) market will hold a major market share in 2025. The growing traffic density on major routes along with the diversification of passenger requirements has resulted in an increased demand for rail traffic management systems. These solutions automatically control and set routes for trains and establish route control in events of operational disruption and also enable a centralized management system for monitoring power supply facilities. The railways ITS service market is expected to witness the fastest growth rate at a CAGR of over 6%. The demand for professional services, including training & consulting and managed services to implement advanced railway management solutions, will increase due to growing needs among the rail operators to focus on core abilities by hiring experts or by outsourcing their needs. Service providers assist in maximizing safety and efficiency by providing effective consultation and safety training, transforming the way rail operators carry out their business. Tracking & monitoring solutions segment in the airways ITS market held the major market share in 2017 and is expected to dominate the market. Monitoring solutions provide timely and real-time information to allow passengers to better understand the information related to flight departures or delays. The adoption of smart airport IoT technologies allows airport authorities to conduct real-time data collection and performance tracking for faster decision-making. An increase in the adoption of various tracking solutions, including asset tracking, employee tracking, vehicle tracking, and airport ground surveillance solutions, to improve resource utilization and visibility will further contribute towards the intelligent transportation system market growth. In the maritime intelligent transportation system market, the demand for advanced solutions providing real-time information about weather condition will increase over the forecast timeline. Smart marine solutions provide operators with real-time information about water currents, wind speeds, and sea surface temperatures, enabling them to plan for a smart and safe course of action. The adoption of IoT-enabled weather forecast solutions to provide accurate weather forecasting will also foster the market growth. North America is expected to hold a dominant share in the ITS market over the forecast timeline. 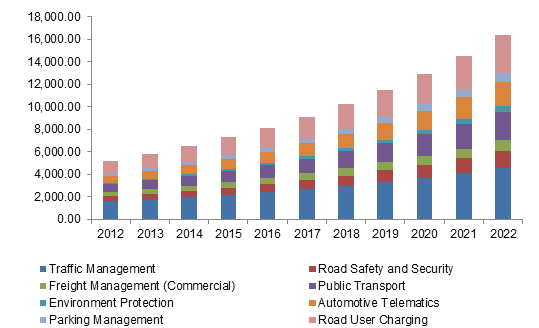 This market growth is driven by the increased adoption of IoT sensors in a wide range of road transport applications, including traffic management, smart parking, and car navigation. For instance, in January 2017, L.A. installed parking sensors to expand LA Express Park, an app powered by the smart-parking program to cover the Los Angeles city. The app helps to minimize inner-city traffic congestions and provides real-time information about the availability of parking spaces. A surge in the number of passenger & commercial vehicles equipped with advanced technological platforms for providing assistance to drivers and monitoring vehicular surroundings to improve the vehicle’s performance will also drive the demand for smart vehicular technologies. Another factor accelerating the market growth is the various steps taken by government agencies to revolutionize the transportation industry. For instance, in April 2016, the U.S. Department of Transportation (DoT) and U.S. Department of Energy (DoE) collaborated to accelerate demonstration and R&D and to implement smart transport systems and alternative fuel technologies. The competition in the global intelligent transportation system market is characterized by R&D investments by market players directed toward the development and commercialization of innovative ITS solutions. Companies operating in the market are securing ITS contracts from various agencies focused on providing solutions, including smart parking systems, smart tolling systems, and systems incorporating vehicle to everything technology. For instance, in March 2016, Siemens was chosen by the U.S. Department of Transportation (DOT) to provide its latest vehicle-to-infrastructure (V2I) technology for a Connected Vehicle pilot project. The company’s technology-enabled pedestrians and vehicles to efficiently communicate with traffic infrastructure components, such as traffic lights and intersections in real-time, leading to reduced congestion during peak hours. In 2017, Huawei launched intelligent bus transportation solutions in South Africa. This IoT-enabled service offers benefits such as precise passenger tracking, in-bus video surveillance, real-time bus data, in bus entertainment, and emergency communication service. The company is also working with various partners in Africa to enhance and promote the use of intelligent applications. Companies are also entering into strategic partnerships to develop smart transportation technology. For instance, in October 2016, the company along with GRIDSMART Technologies, a provider of single-camera solution for traffic management, showcased vehicle to infrastructure communication between GRIDSMART’s single-camera intersection management system and a prototype of its own 5.9 GHz radio. The communication system provides a link between vehicles that have smart transportation technology incorporated in them and those that don’t have it incorporated. 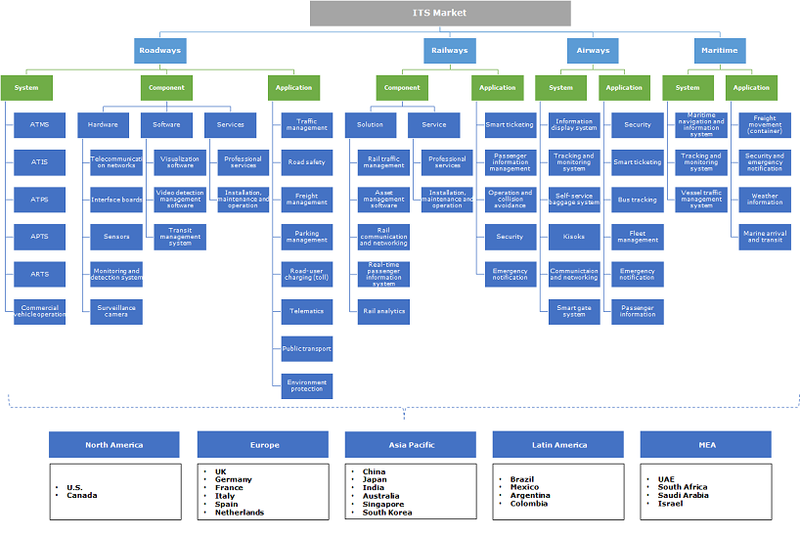 The major companies operating in the intelligent transportation system (ITS) market include Advantech Co., Ltd., Bestmile SA, Clever Devices Ltd., Denso Corporation, EFKON AG, ETA Transit Systems, GMV Group, Hitachi Ltd., Kapsch Trafficcom, Lanner Electronics, Moxa Inc., Nuance Communications, PTV Group, Q-Free ASA, Rhythm Engineering, Telegroup, Thales Group, TomTom N.V., Transmax Pty Ltd., Trapeze Group, WS Atkins PLC, and Xerox Corporation. Due to rapid industrialization and urbanization, there has been a rapid transformation in the transportation sector with the adoption of smart transportation facilities. These include the adoption of advanced technologies, such as IoT and sensors, which are incorporated in toll booths, roads, traffic lights, and bridges, thus enhancing their communication with vehicles. Innovations in new technologies have reduced the shortcomings of transportation systems by allowing real-time analysis of traffic patterns, thus making smarter and safer use of transport systems. A surge in the number of vehicles has led to increased congestion in cities around the world. Thus, government agencies of various countries have invested in smart city projects with an aim to provide good infrastructure, smart transportation systems, and smart healthcare to all the citizens.